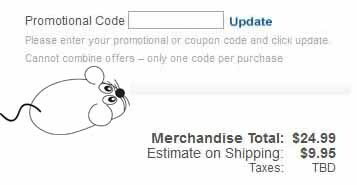 After shopping at Constructive Playthings.com, enter your coupon code on the 'Shopping Cart Overview' page in the box called 'Promotional Code' and then click on 'Update' to add the coupon to your order. Easy cheesy! If you need to contact them with a question about your order you can call them at 1-800-448-1412. Only one coupon per order. About Melissa & Doug: They create classic, well-designed, educational toys at very reasonable prices.